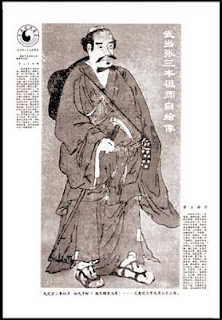 Below are two Tai Chi Ch'uan Classics written by the two of the greatest Masters in history. These two classics explain the principles that must be incorporated into your practice and application of the art. I have been researching Tai Chi for many years and find that these interpretations by Lee N. Scheele to be widely accepted by accredited Masters and teachers everywhere. I hope that everyone practicing Tai Chi will discover the Wisdom contained in these classics and use it to complete the integration of mind, body, and chi into pure Integrity of Being - Present Oneness with our True Nature. 5.) Sink the shoulders and drop the elbows. The shoulders will be completely relaxed and open. If you cannot relax and sink, the two shoulders will be raised up and tense. The ch'i will follow them up and the whole body cannot get power. "Drop the elbows" means the elbows go down and relax. If the elbows raise, the shoulders are not able to sink and you cannot discharge people far. The discharge will then be close to the broken force of the external schools.